With a mature market economy and political stability, Uzbekistan has developed a strong legal regime that both fosters and protects business activity. Among the CIS countries it is considered to be second only to Russia in its attractiveness to foreign investors. This updated edition of an essential resource for businesses and their counsel presents reliable English texts, in the peerless translations of W.E. Butler, of all the principal enactments affecting business activity in Uzbekistan. All texts are current as of April 2000. This book is of unique value to any executive, lawyer, or academic with an interest in transnational business. Preface; W.E. Butler. Legislation. Economic Societies and Partnerships. Law on Investment Activity (24 December 1998). 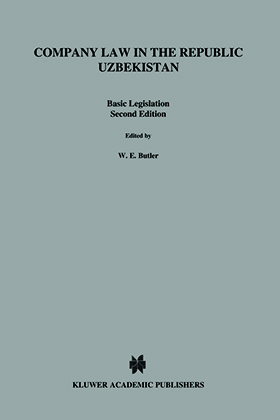 Law on Enterprises in the Republic Uzbekistan (1991, as amended). Law on Economic Societies and Partnerships (1992, as amended). Law on Joint-Stock Societies and Defence of the Rights of Stockholders (1996, as amended). Decree on the Procedure for the Introduction into Operation of the Law of the Republic Uzbekistan on Joint-Stock Societies and the Defence of the Rights of Stockholders (1996). Law on Destatisation and Privatisation (1991, as amended). Law on Pledge (9 December 1992, as amended). Law on Banks and Banking Activity (1996, as amended). Decree on the Introduction into Operation of the Law of the Republic Uzbekistan on Banks and Banking Activity (1996). Law on Securities and the Stock Exchange (5 May 1994, as amended). Law on the Stimulation of Small and Private Entrepreneurship (1995, as amended). Law on State Control of the Activities of Economic Subjects (1998). Bankruptcy. Law on Bankruptcy (1994, as amended). Taxation. Tax Code of the Republic Uzbekistan (24 April 1997, as amended). Enterprises with Foreign Investments. Law on Foreign Economic Activity of the Republic Uzbekistan (1991, as amended). Law on Foreign Investments (1998, as amended). Law on Guarantees and Measures of Defence of the Rights of Foreign Investors (1998), Statute on the Procedure for Conducting Legal Expert Examination, State Registration, and Liquidation in the Republic Uzbekistan of Enterprises with Foreign Investments (2 July 1997, as amended). Statute on the Procedure for the Registration of Enterprises with Foreign Investments as Participants of Foreign Economic Relations (2 July 1997). Law on Free Economic Zones (1996).